Peter Schickele and An Die Musik performing Mr. Schickele’s recent family-friendly adaptation of the classic children’s story. Newport Classics LC 8554. 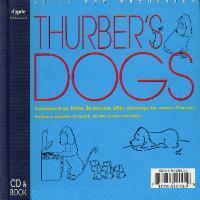 A children’s collection of music by classical composers based on classic stories, narrated by Julie Andrews and Peter Schickele. Classic Raps CR02D. 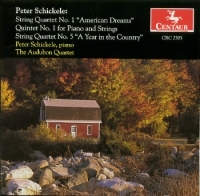 The Audubon Quartet and Peter Schickele, piano. Centaur CRC 2505. 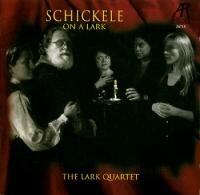 Peter Schickele and the Lark Quartet perform works of Peter Schickele (String Sextet, String Quartet No. 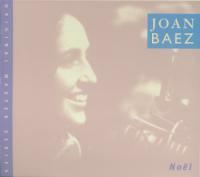 2 “In Memoriam” and Quintet No. 2 for Piano and Strings). Arabesque Z7619. 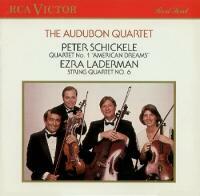 Recorded for RCA Victor by The Audubon Quartet, which commissioned the work. With Ezra Laderman’s String Quartet No. 6. RCA CD-7719-2. Features the “Horse Opera For Brass Quintet” and the Piano Concerto #2 in F Major (“Ole”), plus other Peter Schickele pieces for Brass Quintet. 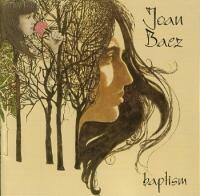 Winner of a Grammy Award in 2000 for Best Classical Crossover CD. Newport Classics NCD 85638. Wanted for low-down playing and bass behavior. 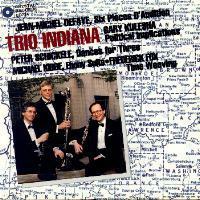 Music for bassoon quartet, including Peter Schickele’s Blue Set No. 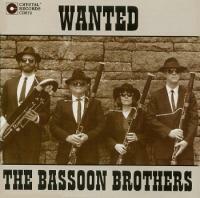 2 for four bassoons. Crystal Records CD873. 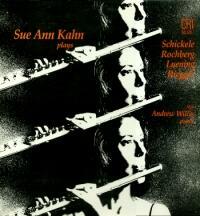 for flute and piano, on Sue Ann Kahn plays Schickele, Rochberg, Riegger and Luening. Composers Recordings Inc. CS-CAS-531. Cassette only. The former is a Music Theater Piece for Renaissance Ensemble performed by Calliope. The Quartet for clarinet, violin, cello, and piano is performed by members of Chamber Music Northwest. Vanguard LP-71278, CS-71278. Supplies are limited. 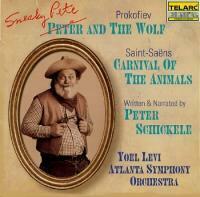 Prokofiev: Peter (Sneaky Pete) and the Wolf; Saint Saens: Carnival of the Animals; Written and Narrated by Peter Schickele. Telarc CD-80350, CS-80350. Supplies of cassette version are limited. Five songs for French Horn and Orchestra. 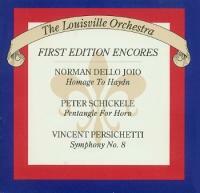 The Louisville Orchestra, Jorge Mester conducting. Horn soloist: Kenneth Albrecht. 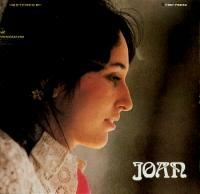 Albany Records CD-024-2. 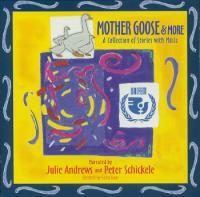 A selection of poetry sung and spoken to original music by Peter Schickele. Digitally re-mastered with three additional tracks from the same recordings sessions. 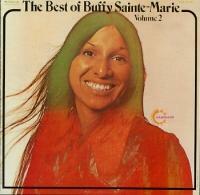 (The 1968 version is also available on LP below.) Vanguard CD-79275. 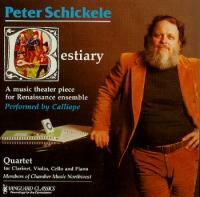 Songs arranged by Peter Schickele. Digitally re-mastered with two additional tracks from the same recording sessions, including Peter Schickele’s arrangement of Autumn Leaves. (The 1967 version is also available below.) Vanguard CD-79720. 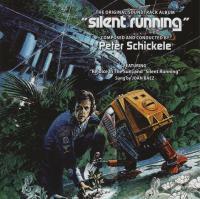 A selection of poetry sung and spoken to original music by Peter Schickele. (This is the original 1968 version. Also available in a re-mastered 2003 CD above.) Vanguard LP-79275. Only available on LP and supplies are limited. 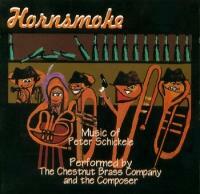 Songs arranged by Peter Schickele. (This is the 1967 version. Also available in a re-mastered 2003 version above.) Vanguard CD-79240. Supplies are limited. The music from the long running Broadway musical with lyrics and music written by The Open Window (Robert Dennis, Peter Schickele, Stanley Walden). Warning: explicit language for mature adults only. DRG Records CD-19035. LP = A superior recording technology which allows for the largest possible range of audio frequencies, larger graphics and liner note packages, immediate “needle-drop” random track access, and added warmth and color from “surface noise”. But wait, there’s more! The above list contains all of the Peter Schickele recordings that are available for sale from Ye Olde Schickele Shoppe. But what about P.D.Q. Bach recordings? And what about recordings that aren’t available? Fortunately for the dedicated collector, this Web site also contains separate pages for P.D.Q. 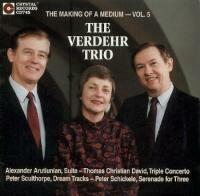 Bach recordings and hard to find recordings.